On the one warmish day packaged between a string of frozen ones, the kids ask if we can make a bonfire and roast hot dogs outside. We only have two hot dog buns and no paper plates, but it doesn’t matter. The kids follow Steven outside to gather twigs from the yard while I get skewers out for the hot dogs. I walk out to the deck and help the kids carry plastic deck chairs down the stairs chairs and out to the fire pit. 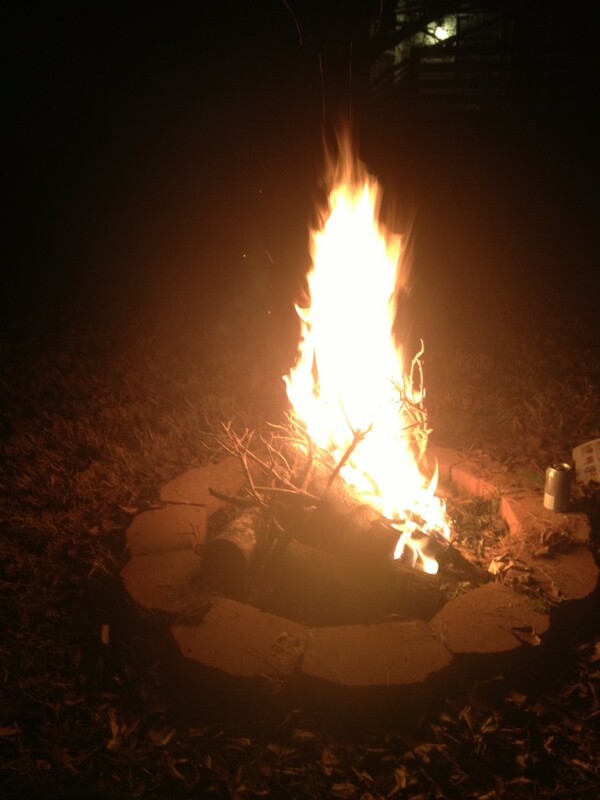 Steven made this fire pit months ago, and we’ve never used it. Madeleine and Ephraim exclaim when the fire lights. It’s twilight. The edge of the sky is still pink, but overhead it’s that pale gray-blue of dusk. I bring the hot dogs out and the kids crouch low near the fire, marveling at its life. When our hot dogs are blackened, we head inside and everyone fixes a plate, grabs a bottle of water, and goes right back out. We sit around our backyard fire in the warmth of each other’s presence. The kids point out a large nest in our bare Bradford pear tree. I wonder if all of our birds have found a warm place to stay for now. Our dogs saunter over, cautiously inspecting the fire, sitting at our feet. When everyone is done, they hand their plates to me, which I stack up on my lap. Steven adds a log to the fire, and the kids toss wads of crumpled newspaper on top. The flames burn high and hot. 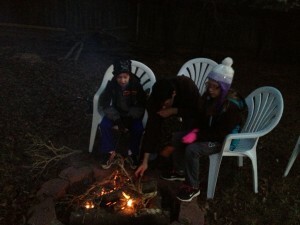 The kids circle the fire in an “Indian dance,” whooping and hollering. Their voices ring out, soar up past our trees, into the darkening heavens, as high as the handful of stars above us. We don’t stop time, but we indwell it. We enter into it, and we make our own light. This is our life, here in the right now, in the evening dusk, in the shouts of children, in the breaking of bread. This is what saves us: The determination to live beside the fire at twilight, to know how to both fear and love it, to know to celebrate each moment, each passing minute that threatens to take us into the night. This is what saves us: The courage to stand in the brightness, the movement toward warmth, the moments lived beside someone, the reaching out to hold another human hand.